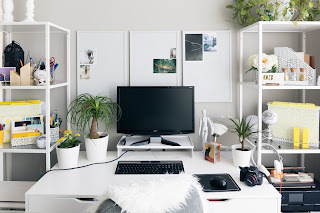 Whether you work from home or just use your work area to organize finances, a clean, neat and organized desk area can be a great help in preserving your sanity. Here are some tips for keeping your work area clean and ready for daily use. Dust your work area. Dust can really alter a work environment. It makes allergy sufferers uncomfortable as wall as clogs computer vents and other machines. Be sure to dust your work area routinely to avoid dust build up. Disinfect surfaces and computer accessories. Work areas are notorious for spreading germs. It's easy to forget how much you touch your desk, mouse or keyboard on a daily basis. These areas can become breeding grounds for bacteria, especially in work areas that you also eat food. Keep monitors clean. Monitors seem to attract dust, fingerprints and mystery spots. Nothing is as annoying as a dingy monitor. For an inviting and enjoyable work area be sure to keep your monitors clean.